Apple unleashes the iMac Pro, the most powerful Mac ever! Apple today (12/14) unleashed iMac Pro, an entirely new product line designed for pro users who love the all-in-one design of iMac and require workstation-class performance. With Xeon processors up to 18 cores, up to 22 Teraflops of graphics performance, and a brilliant 27-inch Retina 5K display, iMac Pro is the fastest, most powerful Mac ever made. iMac Pro delivers incredible compute power for real-time 3D rendering, immersive VR, intensive developer workflows, high megapixel photography, complex simulations, massive audio projects and real-time 4K and 8K video editing. With next-generation processors, a stunning Retina 5K display, the most powerful graphics ever in a Mac, super-fast storage and advanced I/O, iMac Pro is designed to handle the most demanding pro workflows and is the first all-in-one built from the ground up to deliver true workstation-class performance. Featuring an all-new thermal architecture, iMac Pro delivers up to 80 percent more cooling capacity in the same amazingly quiet, thin and seamless aluminum and glass enclosure customers know and love. Still just 5mm at its edge, iMac Pro comes in a stunning new space gray finish with a matching Magic Keyboard, Magic Mouse and optional Magic Trackpad, and features the best Mac display ever, with 500 nits of brightness, a P3 wide color gamut and support for 1 billion colors, delivering an even more vivid and true-to-life viewing experience. iMac Pro also comes with four microphones with beamforming technology, a new 1080p FaceTime HD camera with enhanced low-light performance, and new speakers that are up to 50 percent louder. 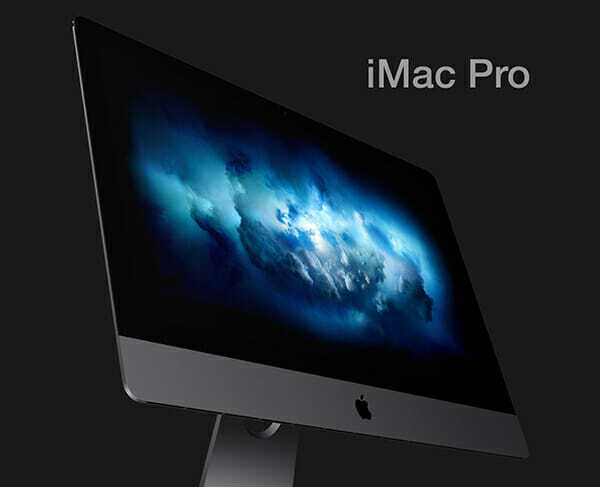 to order the iMac Pro! Featuring a next-generation compute core and up to 16GB of on-package high-bandwidth memory (HBM2), iMac Pro with the Vega GPU delivers up to an amazing 11 Teraflops of single-precision compute power for real-time 3D rendering and high frame rate VR. And for half-precision computation, ideal for machine learning, iMac Pro delivers up to an incredible 22 Teraflops of performance. iMac Pro also supports up to 4TB of SSD and up to 128GB of ECC memory, and with four Thunderbolt 3 ports, can connect up to two high-performance RAID arrays and two 5K displays at the same time. For the first time ever on a Mac, iMac Pro features 10Gb Ethernet for up to 10 times faster networking. • 3D designers can visualize huge 3D models and render scenes up to 3.4 times faster. • Developers can run multiple virtual machines and test environments, and compile code up to 2.4 times faster. • Scientists and researchers can manipulate massive data sets and complex simulations, visualizing data up to 5 times faster. • Photographers can work with enormous files and perform image processing up to 4.1 times faster. • Music producers can bounce (export) massive multi-track projects up to 4.6 times faster and use up to 12.4 times as many real-time plug-ins. • Video editors can edit up to eight streams of 4K video, or edit 4.5K RED RAW video and 8K ProRes 4444 at full resolution in real time without rendering. The iMac Pro can also export HEVC video 3 times faster. iMac Pro brings a new level of integration and security to the Mac with the T2 chip, Apple’s second generation custom Mac silicon. By designing and integrating several new controllers — such as the System Management Controller, image signal processor, audio controller and SSD controller — T2 delivers new capabilities to the Mac like enhanced imaging processing for the FaceTime HD camera. T2 also enables a new level of security by including a secure enclave coprocessor that provides the foundation for new encrypted storage and secure boot capabilities. Dedicated AES hardware encrypts data on the SSD without affecting performance, while secure boot ensures that only trusted software loads at startup. In addition to the new iMac Pro, Apple is working on a completely redesigned, next-generation Mac Pro architected for pro customers who need the highest performance, high-throughput system in a modular, upgradeable design, as well as a new high-end pro display.